The 2017 M1 Rescue™ Hybrid features improved distance and versatility with the first-ever sliding weight track in a Rescue club. 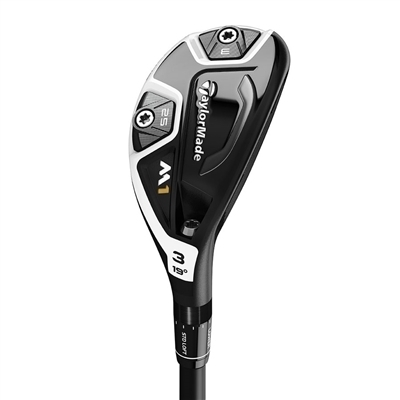 With a moderate size, Tour-proven shape, and a newly designed sole, the new M1 RescueTM Hybrid offers more playability from an increased variety of lies. The new sliding weight track makes the new M1 Rescue™ Hybrid the company’s most adjustable hybrid ever, providing golfers the opportunity to not only experience the neutral/fade biases of its predecessor, but also the added option of a draw setting—as well as anything in between—for ultimate shot shape adjustability and personalization. In addition to the new 27g sliding weight track and advanced sole design, the head comes equipped with a new 3-degree, ultra-lightweight, aluminum Loft Sleeve. The new M1 Rescue will be offered in 19° (3), 21° (4) and 24° (5) options while LH models will be offered in 19° and 21° option.